When you first start playing guitar, you learn that there is a great number of skills and techniques you need to practice to reach your goals. As months and years go by and you practice these elements, you think you are making progress in your guitar playing…yet you continue to freeze up when improvising, recording, or playing for others. Worst of all, “learning more things” doesn't seem to fix the problem - you continue to freeze up and make mistakes while playing guitar “when it really counts”. So why is it that your playing doesn't seem to be getting better despite the efforts you put into practicing guitar? The answer is that you are not able to play guitar fluently. What does this mean? It means that, while you may know many things about playing guitar, you are not able to combine and use these elements easily in your guitar playing. The biggest reason this problem happens is because most guitar players practice something just to get it right ONCE and then they think they’re done, and want to move on and learn something new. This kills your ability to integrate and use all of your guitar skills fluently, which in turn kills your chances to become a great guitarist. This is similar to a student taking a test at school. Many students try to simply pass the test and they don’t try to actually learn the material. While they may end up passing, they forget everything as soon as the test is over. Don’t be the student whose only goal is to “pass”. Until you learn how to practice guitar effectively, you will never be able to master all aspects of your guitar playing. Guitarists who most often fail to reach their goals (despite having the potential to do so) often fall into 2 groups. Guitarists in the first group are not concerned with mastering anything - they only want to learn new things all the time. Having this mindset holds back your guitar playing due to lack of integration of your musical skills (more on this below). Guitarists in the second group are “perfectionists” - they focus on absolute mastery of every individual element of their guitar playing and are afraid to move on to practice something else until the previous item has been mastered. Fact is, you CANNOT master any musical skill in isolation (I explain why in this video about the best way to learn guitar). If you try doing this, at best you will only end up with pieces of musical knowledge that you can’t truly use. Most likely you will give up out of frustration when you realize how much time you are spending trying to master things in isolation (and never getting anywhere). 1. Begin learning the new skill in isolation to learn it on a basic level, without worrying about application or fluency yet. Most guitar players do this, but they end up spending too much of their practice time on this step and never do the following steps. 2. Practice applying the skill you learned in step 1. To practice this, you need to recreate a real-life musical scenario. For example: after you learn a new arpeggio shape, apply it in soloing over backing tracks - creating many guitar phrases that include this new arpeggio. No matter your overall skill level as a guitarist, you MUST practice integrating your skills together to truly reach your musical potential. 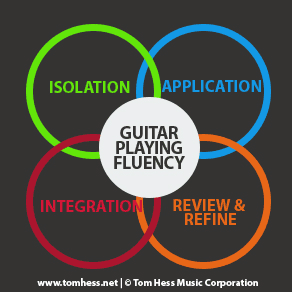 Lack of integration is one of the most common problems that guitarists at intermediate level and above suffer from and is one of the most important areas I work on with my online guitar students to help them become awesome musicians quickly. 4. Review and refine your new skill. This means that you go back to step 1 and again practice your new skill in isolation, having acquired deeper understanding of what elements of the skill still need to be improved (from applying and integrating it in steps 2 and 3). Then move on to applying the skill in more new contexts and integrating it with other skills/techniques until you are back to step 4 - review and refine. 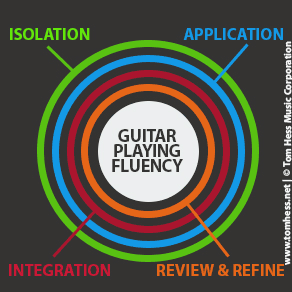 Going through this cycle will help you make giant leaps towards guitar playing fluency. Rotate your exercises when you practice guitar, so that different aspects of your guitar playing are in different phases of mastery at any given time. This will keep your rate of progress very high. To do this right, you need to have the very best and most efficient guitar practice schedules customized specifically for you. Work with a master guitar teacher who knows how to pace the flow of new content (so that you never get stuck trying to master any one thing for too long) and who also doesn’t constantly bombard you with new material. 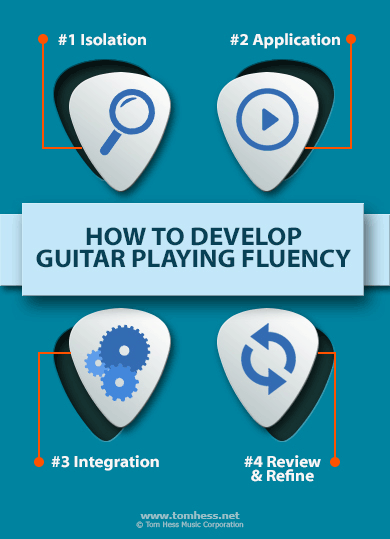 Now that you know how and why to focus on fluency of your guitar playing, watch this free video to learn more about the best ways to practice guitar and speed up the process of reaching your musical goals. Learn how to master guitar by studying with me in my electric guitar lessons online.